Oliver Cromwell: God's Warrior and the English Revolution (British History in Perspective) Professor Ian Gentles. 288 pages Publisher: Palgrave Macmillan. 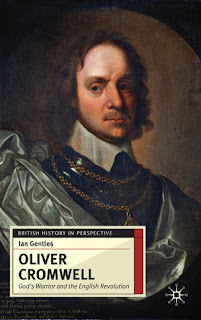 Ian Gentles’ book (a welcome addition to the British History in Perspective Series edited by Jeremy Black) is the first new biography of Oliver Cromwell in many years. The book contains significant new research, and Professor Gentles presents us with a far more in-depth picture of the private and public life of Cromwell than have previous biographers. It does not break much new ground from a historiographical perspective, but to his credit, the author does try to infuse his new biography with the work of previous scholars. The book is ideal for students and the general public and should be used as an excellent introduction to the subject. That we now know more about Cromwell than we did even ten years ago is down not only to a renewed interest in the man but to the tremendous efforts of a growing number of historians. The work of Andrew Barclay has given us a far clearer picture of Cromwell’s early political life, while John Morrill and his team of historians and researchers are working on new critical editions of Cromwell’s collected works. Recently I asked Professor Gentles what motivated him to do this biography. He replied: ‘I am fascinated by Oliver Cromwell, and believe that I understand the ‘inner man’ better than most historians, especially his religion, which is of such fundamental importance in understanding him. Finally, I believe I had some original information and insights to impart. Through my research in the Close Rolls (NA, C 54) I turned up material on his personal finances of which no one else was aware. I am also the first person to draw public attention to the ‘Fleetwood Chest’, his wedding gift to his daughter Bridget, now held in the Collins Barracks Museum in Dublin. I also believe that I have successfully interwoven his political and military careers and shown how they were interconnected, and influenced each other’. Despite this, Gentles still feels the need to justify the need for a new biography in his foreword, arguing that the new evidence he alludes to above should throw up new interpretations and to some extent this book is a slightly new interpretation. This Cromwell biography manages to strike a balance between Cromwell’s public and private life, although to my mind Gentles concentrates too heavily on Cromwell’s military career to the detriment of spending more time on his political activities. He does present a ‘warts and all’ picture of Cromwell but also attaches importance to recent research on Cromwell’s practice of lay preaching and his significant patronage of the arts. To his credit does attempt to counter the old picture of Cromwell as a dour and cultureless figure. Gentles spends time on his new research into Cromwell's pay as a soldier, in chapter ten asking if Cromwell ‘was a greedy puritan’. Gentles is accurate in his assertion that many modern day historians have paid little attention to Cromwell’s economic position or for that matter even his personal finances. Gentles is correct when he implies that Cromwell was not guided solely by money in his social and political actions. In fact, on many occasions, he cancelled debts and on more than one occasion financed military operations himself – such as the occupation of Ireland. Cromwell was not alone in doing this as other major Republican figures such as Henry Marten did the same. Gentles is perceptive enough to grasp the importance of the work of historians such as Robert Brenner, and while being critical of Brenner’s ‘social interpretation,’ he acknowledged that a study of mercantilism would enhance the theory that the there was a transition from feudalism to capitalism. Gentles does spend a significant amount of time on military matters. He acknowledges that Cromwell had no formal military training. Gentles it seems does not rate him highly as a military figure which is a little strange because if you read Royalist supporting military historians like Peter Young you get a much more accurate picture of Cromwell’s military prowess. Secondly, while taking on board some aspects of revisionist and post-revisionist historiography, Gentles centres Cromwell’s life as part of a ‘people's revolution’, indicating that the influence of Marxist historians such as Christopher Hill and Brian Manning is not entirely dead. Professor Gentles is one of the few modern day historians who does not downplay the influence that groups such as the Levellers had. Gentles does offer a fresh insight into the complex relationship between Cromwell and Leveller leaders such as John Lilburne. In fact contrary to modern historiography Gentles provides a description of Cromwell being a far more radical figure than has previously been thought. Thirdly, and perhaps more controversially, where Gentles does subscribe to one aspect of modern historiography is when he describes Cromwell belonging to a ‘Junto’. The definition of Junto is ‘a group of men united together for some secret intrigue’, with the champion of this new historiography is being John Adamson. The main theoretical premise of his book The Noble Revolt is to put forward a view of the Civil War as basically a coup d’état by a group of nobles or aristocrats who no longer supported the King. According to Diane Purkiss, these nobles were ‘driven by their code of honour, they acted to protect themselves and the nation. Names such as Saye, Bedford, Essex and Warwick move from the sidelines to occupy centre stage, as do their counterparts among Scottish peers. It was they and not the rude masses who plucked a king from his throne. Oliver Cromwell, for Adamson, was merely one of their lesser lackeys’. The more you get to know Gentles’ work the clearer it becomes that he is attempting to take a middle ground between the modern-day revisionist historians and an older more left-wing historiography. While not rejecting that Cromwell was part of a ‘Junto’, I think far more work is needed to either prove or disprove this thesis. After all, Cromwell had a series of alliances throughout his career. To paraphrase Lord Palmerston, he had no permanent alliances but only permanent interests. Gentles biography does not go into too much detail on this, but maybe in the future, he will. Revolutions by their nature are destructive, but out of that destruction hopefully, something new and better arises. In the case of the English revolution, we witnessed all be it slowly the transition from feudalism to capitalism. Cromwell whatever his faults played an critical role in that process. I will leave it to others to decide whether Cromwell’s adventures in Ireland are a blot on his record as Gentles suggests, but he does make some interesting points, arguing that Cromwell's overriding concern in Ireland was the neutralisation of Royalist threat and that the attack on, and massacre of, Catholics was a by-product of that action. Cromwell’s hatred for Catholicism was prevalent amongst the rising bourgeoisie of the 17th century. He further suggests that Cromwell played a key part in the development of Irish nationalism. To conclude, I would recommend this book to general readers and more academically minded students, as it is an intelligent and well-researched introduction to Oliver Cromwell. It has extensive footnotes and a lengthy bibliography, a useful list of abbreviations, a detailed index, good maps and battlefield plans. It is only inevitable that Gentles does revisit the same areas of research covered by other historians such as Christopher Hill, John Morrill and Barry Coward, but whether or not this biography transcends those written previously, it is certainly a valuable addition to the literature. (1) The New Model Army in England, Ireland and Scotland, 1645–1653 (London, 1992); Soldiers, Writers and Statesmen of the English Revolution (Cambridge, 1998); and The English Revolution and the Wars in the Three Kingdoms, 1638–1652 (London, 2007). (5) Oliver Cromwell: God’s Warrior and the English Revolution. By Ian Gentles. Review by M Bennett . History vol 97 issue 326 17 April 2012. (2) More information on the new critical edition of the collected works of Oliver Cromwell can be found through this link http://www.hist.cam.ac.uk/research/research-projects/early-modern/new-edition-of-Cromwell. (3) Professor gentles is working a biography of Col. Thomas Pride for the History of Parliament, His longer-term project is a book on Ireland and England in the 16th and 17th centuries, with particular attention to the plantations of the 1650s. Excellent drama and history of the trials of the men who killed Charles I and the revenge of the monarchy that they tried to abolish, the sources are well represented here and here their own words and testimony. I really enjoyed this review - thanks for posting it, I must get round to reading Gentles's book soon. On the subject of Cromwell and the junto, I don't think it's disputed that he was involved in its fringes during the early 1640s. His links to Oliver St John and through that to the circle around the Earl of Warwick and Viscount Saye and Sele are well documented. Where historians disagree - and ultimately the evidence is too slender to prove either way - is quite how much a part of the circle he was. It's possible to see his interventions in the Long Parliament in 1640/41 as naive and over-reaching, misjudging the politics of the day, but equally they can be represented as Cromwell flying kites for the junto in full knowledge that they might get watered down (but recognising someone needed to start negotiations). Personally I think Cromwell's involving in freeing John Lilburne points more towards the latter, but whichever interpretation you take it's clear Cromwell was only a minor player at this stage. John Adamson is good on this in his chapter on Cromwell and the Long Parliament in John Morrill's "Oliver Cromwell and the Puritan Revolution". A Short Q&A with Professor Ian Gentles. Q. What made you write another biography of Cromwell? A. I wrote this biography because the publisher invited me to. In addition, I am fascinated by Oliver Cromwell, and believe that I understand the 'inner man’ better than most historians, especially his religion, which is of such key importance in understanding him. Finally, I believe I had some original information and insights to impart. Through my research in the Close Rolls (NA, C 54) I turned up material on his personal finances of which no one else was aware. I am also the first person to draw public attention to the "Fleetwood Chest", his wedding gift to his daughter Bridget, now held in the Collins Barracks Museum in Dublin. I believe also that I have successfully interwoven his political and military careers and shown how they were interconnected, and influenced each other. Q Are you aware that Prof john Morrill and his team are working on a new critical edition of the collected works of Oliver Cromwell. A. Yes, I know about the forthcoming critical edition. John Morrill is a good friend of mine, and we have discussed many aspects of Cromwell's life. The critical edition will be most welcome since WC Abbott's edition is unsatisfactory in many respects. A.It is striking that new material on Cromwell is being turned up all the time. In particular Patrick little has written about the Protectorate, as well as Cromwell's daughters' marriages, his interest in horses, and music, and his sense of humour. Andrew Barclay has written a valuable study of Cromwell's early life, in which he has solved the puzzle of how Cromwell managed to get elected for the borough of Cambridge in 1640. Both Little and Barclay have kindly shared with me their research findings in advance of publication. Blair Worden is preparing a keenly-awaited intellectual biography of Cromwell. Q What are you working on now. A.This summer I am writing the biography of Col. Thomas Pride for the History of Parliament, and preparing a keynote address to the Midwest Conference on British Studies on the state of play in Civil War studies. My longer-term project is a book on Ireland and England in the 16th and 17th centuries, with particular attention to the plantations of the 1650s. Ian Gentles book is the first new biography of Oliver Cromwell in many years. The book contains significant new research and professor Gentles presents us with a far deeper picture of the private and public life of Cromwell. It does not break much new ground from a historiographical perspective, but to his credit he does try to infuse his new biography with the work of previous scholars. Which is a boon for anyone wishing to learn about this great figure of English and world history?. The book is ideal for students and the general public and should be used as a good introduction to the subject. Gentles’ Oliver Cromwell is a recent and very welcome addition to the British History in perspective Series edited by Jeremy Black. My one complaint is that outside of Amazon and a few other online booksellers the book is extremely difficult to get hold off. That we know more about Cromwell recently than say ten years ago is down not only to the renewed interest in Cromwell but to the tremendous hard work of a growing number of historians. The work of Andrew Barclay has given us a far clearer picture of Cromwell’s early political life. John Morrill and his team of historians and researchers are working on new critical editions of Cromwell’s collected works. Knowing this why does Gentles feel the need to justify a new biography? In his forward Gentles is a little defensive in this justification. His most important answer to the question is that new evidence should throw up new interpretations and to a certain degree this is a slightly new interpretation. Gentles is a skilled and thoughtful historian. He is Professor of History at York University’s Glendon College and at Tyndale University College. Most of his academic career has concentrated on the English Revolution. He has written significant articles and four books: The New Model Army in England, Ireland and Scotland, 1645-1653 (1992); Soldiers, Writers and Statesmen of the English Revolution (1998) and The English Revolution and the Wars in the Three Kingdoms, 1638-1652 (2007). The Cromwell biography manages to strike a balance between Cromwell’s public and private life. Although to my mind Gentles concentrates too heavily on Cromwell’s military career to the detriment of spending more time on his political. He does present a “warts and all “picture of Cromwell. Gentles attaches importance to recent research on Cromwell’s practice of lay preaching and his significant patronage of the arts. Gentles to his credit does attempt to counter the old picture of Cromwell as a dour and cultureless figure. Gentles spends time on his new research into Cromwell's pay as a soldier. In chapter 10 asks if Cromwell “was a greedy puritan”. Gentles is accurate in his assertion that many modern day historians have paid little attention to Cromwell’s economic position or for that matter even his personal finances. It has become part of modern revisionist historiography to play down the link between a person’s economic status and their political persuasions. I am not saying that their exists an umbilical cord between the two or that historical figures like Cromwell were not motivated into action by their religious and ideological conceptions, but I do insist as Nick Beams eloquently put it “that it is necessary to examine the motives behind the motives—the real, underlying, driving forces of the historical process—and to make clear the social interests served by a given ideology—a relationship that may or may not be consciously grasped by the individual involved”. Secondly while taking on board some aspects revisionist and post-revisionist historiography, Gentles centres Cromwell’s life as part of a “people's revolution”. This tends to show that the influence of Marxist historians such as Christopher Hill and Brian Manning is not entirely dead. Professor Gentles is one of the few modern day historians who does not downplay the influence that groups such as the Levellers had. Gentles does offer a fresh insight into the complex relationship between Cromwell and Leveller leaders such as john Lilburne. In fact contrary to modern historiography Gentles offers a description of Cromwell being a far more radical figure than has previously been thought. Thirdly and perhaps more controversially where Gentles does subscribe to one aspect of modern historiography is when he describes Cromwell belonging to a “Junto”. The definition of junto is “a group of men united together for some secret intrigue”. The champion of this new historiography is john Adamson. The main theoretical premise of his book The Noble Revolt is to put forward a view of the Civil war as basically a coup d’état by a group of nobles or aristocrats who no longer supported the King. According to Diane Purkiss these nobles were “driven by their code of honour, they acted to protect themselves and the nation. Names such as Saye, Bedford, Essex and Warwick move from the side-lines to occupy centre stage, as do their counterparts among Scottish peers. It was they and not the rude masses who plucked a king from his throne. Oliver Cromwell, for Adamson, was merely one of their lesser lackeys”. While not rejecting that Cromwell was part of a “Junto” I think far more work is needed to either prove or disprove this thesis. Gentles biography does not go into too much detail. Maybe in the future he will. To conclude I would recommend this book to general readers and more academically minded students as it is an intelligent and well researched introduction to Oliver Cromwell. It has extensive footnotes and bibliography, a good list of abbreviations, a detailed index, good maps and battlefield plans. It is only inevitable that Gentles does revisit the same areas of research covered by other historians such as Christopher Hill, john Morrill, Barry Coward to name a few. Having said that Gentles book stands on its own two feet. Is it better than his predecessors only his peers can say? Thank you for the comment. Can you remember where you saw that she met Cromwell? I have just finished an article on Women Levellers and the English Revolution for the blog Hoydens and Firebrands which includes some stuff on Chidley. If you like I can send you some stuff I have on her. It is true she was quite a lady and apparently one of many. Maybe you should do some research on whether she was a relative. Chidley does not strike me as a common name, where are you from. I became excited by Winstanley et. al. through Hill's World Turned Upside Down in the 70s, about the time Kevin Brownlow was creating his movie. Much later, after Christopher Hill gave a talk (on Bunyan), I asked him about the Diggers from the sixties. I noted, that Emmet Grogan's autobiography, Ringolevio mentions that they decided on calling their NYC group (transplanted to San Francisco) the Diggers after reading an English history book. I asked what that book would have been since WTUD came out after the Digger moment. He smiled with delight to remind me, of course, that he had been writing about the Diggers at length at least since the edited collection of documents, The Good Old Cause, in 1949. “You poor take courage; you rich take care/This Earth was made a Common Treasury for everyone to share/All things in common, all people one “.Diggers Song. Winstanley is the stunning 1975 film about the 17th-century revolutionary Digger Gerrard Winstanley. To begin with,, anyone who is looking to view this movie should at least have a basic understanding of the English revolution. To get even more enjoyment out of the movie, they should acquaint themselves with the left wing of that revolution the Diggers and to a lesser extent the Ranters. The film has as one writer put It a “stark monochrome beauty” to it. The film style pays homage to the Russian filmmaker Sergei Eisenstein. The film was clearly a labour of love for Brownlow and Mollo with a large degree of perfection for detail and costume. Winstanley was produced on a minuscule budget £24,000 with a volunteer cast apart from one professional actor, first shown in 1975. This review is of the digital re-mastering carried out by the British Film Institute. What was Brownlow’s inspiration from making this film? Like many people he had become disillusioned with the political set up (this was in 1975),”The Labour Party is no longer the Labour Party. Nor is the Conservative Party. You can hardly tell the difference. We are in a real mess. And I don’t know where we’re heading.”. Why should anyone want to see this film and what relevance does it have today. Like under four hundred years ago we live in a time of wars, revolution and economic upheaval. Social inequality still exists, and democracy does not exist for millions of people. So in this respects, we are not so far away from the people who fought in the English Civil War. According to the writer Marina Lewycka who worked on the film “ it is no coincidence that there should have been a renewed surge of interest in Winstanley and the Diggers in the 1960s and 1970s, at a time when the spirit of revolution was out on the streets, and latter-day Diggers were occupying campuses and squatting houses and apartment blocks. I was a starry-eyed young PhD student in 1970, researching radical thought in the 17th century. What drew me to Winstanley was not only his political radicalism but that he seemed to have a "psychological" understanding of the biblical narrative, unusual at that time, as an allegory of the struggle between good and evil which took place in every human heart”. The director of Winstanley Kevin Brownlow like some people had not heard of his subject matter before starting work on the film. The fact that the movie is so good is, even more, testimony to him and co- director Andrew Mollo’s enthusiasm to learn about Winstanley and apply that learning with such startling effect. Lewycka explains the ethics behind the making of the film “in some ways, the making of the movie Winstanley mirrored the endeavour of the original Diggers. It was an enterprise held together by a shared belief that commitment was more important than money, a lack of hierarchy that occasionally bordered on the anarchic, the spirit of voluntarism, good humour, camaraderie, stoicism in the face of setbacks, and a willingness to submit to the rigours of English dirt and English weather in pursuit of a higher purpose. Like Winstanley, we had our priorities straight. We knew that fame, fortune and ambition were not what it was about; what mattered was doing it properly”. It is only recently that a systematic study of Winstanley has started to emerge. The recent publication of his collected works is one indication of the trend to restore Winstanley to his place as one of the most prominent figures of the English civil war. He is certainly a figure that according to Christopher Hill who turned the world upside down. His form of utopian communism was influenced by John Lilburne and his fellow Levellers. But in ideological terms, he went further than the Levellers in both actions and words. Winstanley founded his commune of Diggers at St George’s Hill, Surrey. The film portrays with heart-breaking accuracy the tremendous poverty of the people belonging to the commune. Who also faced increasing violence at the hands of both New Model Army soldiers and the local population. The commune was to last only two years. Within in that two years, other communities began to spring up, but these were eventually dissolved. In many ways this was a movement way ahead of its time. Winstanley is a superb film. See it if you can. More could have done to explore the ideological differences that occurred during the war. Perhaps in this one case more money would have helped. Having said that Winstanley is still a little gem.